Fans of bands like Deep Purple, Thin Lizzy, Led Zeppelin, Van Halen, and others: Rejoice! Audrey Horne’s Youngblood is yet another fine example that hard rock is far from dead and gone. 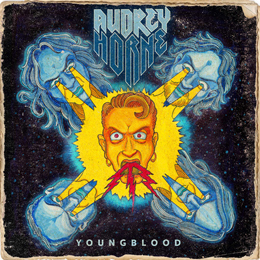 Featuring members of Sagh, Gorgoroth and Enslaved, Audrey Horne make YoungBlood a tribute to 70s-style rock'n'roll while at the same time making it sound new. It's hard rock that isn't afraid to get a little cheesy. . Toschie’s voice gives Youngblood a catchy sound, especially on the rockin’ tunes, such as the title track, “The open sea”, “Straight into your grave” and “The king is dead”. There are times that their fourth full length album reminds me of Foreigner and Boston, but Audrey Horne is luckily more involved than those two bands. So, some tracks left me feeling a little dry but, all in all, this album is slowly making me think it's pretty darn good. Youngblood will be solid addition to anyone's collection that favors hard rock music, infectious melodies, and memorable songs. I think they have a winner here.